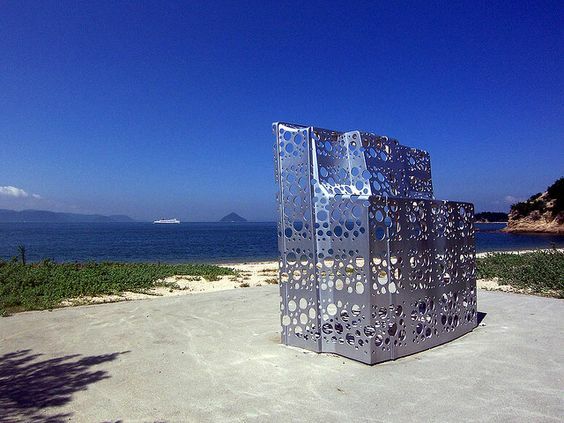 As Vatican City is a religion-dedicated territory, Naoshima is the first art-dedicated territory. A fisher island in the Seto Sea. main japanese islands : Honshū, Shikoku and Kyūshū. The last census has estimated to 3244 the number of living souls on this 14,22 km2 island. Almost a desert island, there is almost no manufacturing. Soichiro Fukutake, C.E.O of Benesse—japanese educational publisher and specialist—continued his father project to revitalise this territory historically dedicated to waste treatment and storage. The father had the ambition to educate children. He thus considered transforming the island into a children leasure park. The son finally shaped an art masterpiece questioning the perception codes in order to educate adults. Inspired by Land Art—for which nature is a frame and a material—Fukutake tries to create the best conditions to receive emotions : an island-artwork, an artwork-island. A fondation, an island, an architect. Church of light in Osaka, project that received the Pritzker price in 1995. Mutual undestanding of the main stakeholders : the billionaire and his architect is the reason of the success. The main exhibition buildings have been created by a single architect Tadao Andō, winner of the Pritzker price 1995, the architecture Nobel price. He designed the museum trilogy : Benesse House, Chichu Art Museum and Lee Ufan Museum. This architectural coherence allow the visitor to receive the heterogeneous artworks in a neutral environnement—of light and concrete—and facilitate to connect the pieces together. Tadao Andō Sculpture, Holes on concrete. Andō also spread its vision of light, color and matter by dispersing his works every where is the island as an answer to other artists work such as Yayoi Kusama or Niki de Saint-Phalle. Exemples of Niki de Saint-Phalle work in Naoshima, The conversation and Camel. A museum—Andō—also presents the majority of this st-art-chitect work, chosen to design the Pinault fondation in an other island, Seguin island in Boulogne Billancourt. The fondation finally set place in Venice in the ancient Palace Grassi. Grassi Palace by Giorgio Massari in Venice constructed between 1748 et 1772. Benesse House Museum, an innovative hotel experience. This hotel, I mean this museum, I mean this hotel, this new concept allows you to live among major contemporary artist work such as Alberto Giacometti, Andy Warhol or Yves Klein surrounded by a nature and exceptional light. When major international museums like Le Louvre display masterpieces across another with no time to digest the significant amount of information received, with no emotions able to come, you can here contemplate a piece with the changing light of day and night. Alone or almost. The collection is very rich and you may discover better other major artists such as : Nam June Paik, Olafur Eliasson, Jasper Johns, Yukinori Yanagi, Jackson Pollock, David Hockney, Richard Long, Tadashi Kawamata, Tom Wesselmann or Louise Nevelson. You enter here like you enter a tomb—Chichu means buried—where three artists only, like egyptian gods, are permitted. Nymphéas by Claude Monet on natural light. The sacred ceremonial helps emotions rise, either linked to organic colors of Monet’s Nymphéas or spatio-temporal thought of well named Time/Timeless/No Time and Open Field by american artists Walter de Maria and James Turrell. Time/Timeless/No Time de Walter de Maria and Open Field de James Turrell. The museum garden has been conceived on mirror effect principle between nature—originally in Giverny and now in Naoshima—and the representation of nature—Monet’s nymphéas. Reproduction in Naoshima of Claude Monet garden in Giverny. Lee-Ufan museum, an other innovative approach. As told by the name the museum is dedicated to the south-corean artist. Lee-Ufan is the only artist, even though Monet or Giacometti are displayed, to have the privilege to have its dedicated museum. Its art reflects more than anyone else the intention of Fukutake. It outsider art—like Andō’s his friend—and conceptual tries to convey an emotion after all. Andō can’t imagine a house only as a shelter, Ufan can’t imagine a sculpture without its original environment. Benesse House brought art in living areas, Art House Project revitalise deserted houses spread on the island. Fondation bought them one by one since 1998 and then give them to artists to implement or create artwork inside. In the Minamidera House, James Turrell installed its “ Backside of the Moon”. The artwork house surrounds you with full obscurity in order to make you fell the light birth emotion when light will slightly turn on. Immersive and breathtaking. A group of islands, an art-chipelago. After Naoshima great success, Benesse decided to develop similar projects in other Seto islands. Inujima first with Seirensho museum—refinery in local language—almost entirely dedicated to the japanese writer Yukio Mishima but also, ancient deserted houses transformed in Art Houses. Earth Gallery at Seirensho museum. On Teshima island, occupied since 14 000 years, art experience is still on avant-garde. Teshima art museum designed by Ryue Nishizawa as a drop shape drilled by two giant holes shelters a single piece, Matrix from the plastic artist Rei Naito. We see water on the ground, a few drops, then streams come along white balls before water evaporates. We naturally look up at the sky and the giant dome before looking down and see that everything is starting again. Drops appearing, streams, water comes in reality from the ground. Two flats regarding Naoshima and closer islands, you will need to travel to Japan and book your visits at least six months in advance.